This paper reviews the fiscal policy reform experience of economies in transition to a market economy, summarizes best practices, and with this background assesses the fiscal policy reforms taking place in Cuba. The paper addresses four main areas: tax policy, tax administration, budgetary and accounting practices, and public expenditure policy. One comment is warranted at the outset. For fiscal policy reform to be effective in a country like Cuba that has a large public sector and where strong elements of a centralized planned economy still persist, significant steps have to be taken to move towards a market economy, particularly in terms of liberalizing the price system, the assignment of factors of production, the financial sector, and the external sector. These reforms do not appear to be taking place in Cuba with the speed that circumstances warrant them. Although the Cuban government does not advocate officially a transition to a full fledged market economy, this paper takes the position that a transition to a market economy would be the most efficient path to improve the welfare of the Cuban people. It is from this perspective that the ongoing fiscal reforms in Cuba are evaluated. It can be argued that socialist economies in transition to a market economy need tax reform urgently.4 Tax reform is a necessary condition for transition because socialist tax systems are incompatible with a market oriented economy. Tax reform can help many other economic reforms which are necessary to restructure the economy, and it is also essential for macroeconomic stability in the transition process. Furthermore, the existing systems of taxation found in socialist economies are not tax systems in the usual sense and tend to be incompatible with a market-oriented economy. In socialist economies, laws of taxation were frequently subservient to laws on wages, input and output prices, and production targets among other things. Frequently, when wages and input prices were raised, tax rates were reduced to accommodate them instead of raising product or consumer prices. This practice did not leave these countries with adequate tax rates when the process of transition began. Since in socialist countries the governments had complete power to introduce taxation there was little need to educate taxpayers or to seek their acceptance. This advantage quickly becomes a disadvantage at the time of the transition because there is very little culture of tax paying. The dominant tax instruments of socialist economies, the enterprise and turnover taxes, were not suited to market economies. The tax base was defined fairly arbitrarily for enterprise taxes in socialist countries— for example, minimum levels of profits were established by the Council of Ministers in Bulgaria; indirectly, the level of profits was affected by wages, interest rates, exchange rates and pricing policies. Extreme arbitrariness also characterized the definition of allowable expenses, exemptions, and deductions which served as an open invitation to bargaining. A practice of differentiating the applicable tax rates, by branches of industry and even by enterprises was widespread. Enterprise taxes were frequently waived if the enterprise could show a financial need. As the state was both the tax collector and the taxpayer, the payment of profits tax as well as other budgetary contributions of enterprises were often negotiated and determined ex post at levels consistent with the planned allocation of resources between enterprises and industries within the public sector. As Ghandi and Mihaljek noted, the transition to a market economy, and the introduction of comprehensive price liberalization, amounted to a death blow to the system of turnover taxation. Once the producers and retailers are free to set their prices in accordance with the perceived relation between supply and demand, it is harder to set a tax equivalent to retail-wholesale price differentials, nor it is possible to defend a multi-rate and cascading-type turnover tax.6 Tax administration becomes more difficult in general. Other important sources of revenue in socialist countries were social contributions and payroll taxes, both of which were collected from enterprises. Wage payments to workers were net of income tax and thus the burden of paying these taxes fell on the enterprises. Personal income tax applied only to incomes of performing artists, writers, sportsmen, inventors, and the smallest of retailers and service providers, who were the ones required to file tax returns. This tax was extremely progressive, if not confiscatory. The reform of personal income taxes become necessary once wage determination becomes a market determined process. The entire structure of the tax base and tax rates have to be redesigned with a view to encouraging instead of discouraging the private sector. Payroll taxes also have to be restructured to ensure that individuals make appropriate contributions to the social security system. Taxes on foreign trade were important in socialist countries. In most cases, customs duties were not considered to be an element of tax policy. Nominal import tariffs were relatively low and the preferred protective devices were quantitative restrictions. However, most raw materials and intermediate goods were imported duty free, so the effective rates of protection varied considerably. The distortive effects of the different rates of protection need to be taken into account as economies are transformed into one where market forces play a greater role. Tax reform in economies in transition face constraints due to the revenue needs of restructuring and the limited technical capacity of tax administration.7 In the short run, efforts need to concentrate on the rationalization of existing revenue sources (enterprise income taxes, turnover taxes, payroll taxes, and tariffs). Based on the experience of the countries of the former Soviet Union, fiscally and economically more efficient forms of taxation, such as the value-added tax (VAT) and the comprehensive personal income tax, cannot be introduced quickly. In the economies in transition in Europe, a clear exception to this was the reform of the existing system of profit taxes on enterprises which was often among the biggest obstacles for successful reform of microeconomic decision making and had to be reformed at an early stage in the transition process. In the short run, tax reform should aim at meeting the large revenue needs of macroeconomic stabilization and the creation of a social safety net; at restructuring the existing tax system toward a structure appropriate for the longer run; at making the existing taxes more stable and transparent; and at making the tax system supportive of other market oriented economic reforms, in ways which are incentive-enhancing and equity improving. Once a process of liberalization starts, the major revenue sources of socialist economies can be expected to come under stress. For example, as a consequence of a price reform, the government is likely to lose control over output and input pricing and the profitability of state owned enterprises will be affected. Turnover taxes are likely to decline because of a drop in aggregate demand, while payroll taxes will also drop because of loss of full employment. As a building block for restructuring the tax system, the existing taxes need to be made more transparent and stable. A balance has to be stricken between implementing tax reform as the political opportunities appear and keeping taxes stable for the sake of investors. Domestic and foreign investors need to know what their various tax liabilities would be when they undertake specific investments. The tax liabilities need to remain stable for a foreseeable period of time as many investments have long gestation periods. The adoption of appropriate measures of taxation can also help support the implementation of price and labor reforms, and external and financial sectors liberalization. To achieve these short run objectives, tax reform should begin in transition economies through the reform of the turnover taxes because price liberalization normally has priority in the sequence of reforms. Negative turnover tax rates (used to provide price subsidies) need to be eliminated; ad valorem rates should be introduced and the number of rates reduced; selected excises need to be introduced; and work begun to introduce a VAT. One thing that need not be overlooked is to widen the tax bases which, unless is done, can limit the benefits of the rationalization of this tax. The main reforms of enterprise taxes that should be introduced are the elimination of the practice of placing arbitrary claims on enterprise profits; and the unification and reduction of tax rates. Other technical issues would need to be addressed such as what type of enterprises will be subject to corporate income tax. For example, the enterprise income tax can be made uniform between corporations, partnerships, and proprietary firms, and the physical owners, be they shareholders, partners, or proprietors, can be taxed only on profits they take out of the enterprise in the form of dividends, profit shares, or salary. Tax systems can adapt to alternative legal forms of business which provide some more flexibility for enterprise growth.8 Should enterprises continue to be state-owned, a charge, in addition to the legislative enterprise profits tax can be levied to reflect a minimum return on past state equity and toward interest on past loans from the governments. In many cases, generous tax holidays for joint ventures and foreign enterprises have been given in transition economies under the mistaken impression that they will be sufficient to attract foreign investment given the presumed comparative advantage in terms of unit labor costs. Frequently, the importance of the economic fundamentals for investment were underestimated and an effort was made to substitute them with the generous tax benefits, while not taking into account the distortions introduced by these tax holidays. At the same time, paradoxically, frequently allowed company tax provisions (e.g. loss carry over provisions) for which a stronger case can be made were not provided for. A transitional step toward the introduction of a personal income tax can be the introduction of a final withholding tax on wages and salaries of those workers whose incomes have come to be determined by market forces. Initially, the withholding tax could be a flat tax at a low nominal rate, collected on pay-as-you- earn basis, without too many complexities of family size, etc. Similar low-rate withholding taxes can also be introduced on other forms of incomes such as interest, pensions, and rentals, without aggregating all incomes earned by an income earner. Although import tariffs are not the first best form of taxation, they can be used as an important source of revenue in the transition. This is particularly important because imports are likely to increase as a result of trade liberalization and trade taxes generally have much lower collection costs than other taxes that also have large revenue potential. Other aspects of trade liberalization as the elimination of quantitative restrictions would have a beneficial revenue effect. However, for import tariffs to play a useful role, highly differentiated structures of implicit import taxes need to be replaced by simpler, preferably uniform, set of ad valorem tariffs applicable to all imports. In order to avoid the potential problem of longer-term industrial inefficiency, there ought to be a phased program of tariff reductions. This should be announced at the beginning of the period of tax reform. Finally, some forms of property taxes can be introduced, particularly at the local level. This can be introduced at the same time that privatization of land and housing is launched. An initial problem is how to determine the assessed value of the properties; if market values are not available they can be based on existing rental values properly indexed. In the medium to long run, tax reform has to emphasize more the attainment of the familiar properties of a good tax system: neutrality to minimize distortions, equity to ensure fairness, and simplicity to facilitate its administration. With these objectives in mind, policy makers need to avoid provisions usually intended as short run remedies, which tend to become entrenched in the tax code once adopted. To avoid this problem, it is important at the outset to articulate the nature and characteristics of the desired long run tax system. Two key issues will need to be decided: which enterprises will be subject to the VAT and to what sectors the VAT should apply. It has been recommended that the liability to VAT in transition economies should be defined for all traders through the retail stage with an exemption applied only on the basis of turnover.11 The choice of the threshold for liability to the tax should be made with an eye to simplifying the administration of the tax. In principle, the base of the VAT should be as wide as possible, and exemptions should be avoided that would quickly generate a strong lobby for further exemptions. The limited availability of consumption goods in transition economies argues for making food subject to the tax. But to the extent that there are a lot of sales of basic foodstuffs sold directly from the farm to consumers, probably makes the taxation of these commodities unrealistic at the outset. Financial services are frequently not taxed under the VAT and it should not be recommended for transition economies at a time when they are trying to promote this key sector. For the full economic benefit of the VAT to be realized it should have other desirable features such as, for example, the exclusion of purchases of capital and intermediate goods from the tax base, a single structure with few exemptions, and a zero rating of exports. In transition economies moving to democracy and as a reaction to central government control, there was an upsurge of enthusiasm for local minority issues. The temptation arose to use the VAT as a major revenue source for subnational governments, but in a federation, the VAT is not a good state or local tax. Those countries which have tried to use the VAT at the subnational level, have had to use very complex administrative systems. The basic problem is that for VAT revenue to be apportioned within a federation, the VAT content of goods and services crossing state or provincial boundaries must be checked and settlements made. As success is achieved in putting in place a consumption tax of the form of the VAT at the national level, further steps should be taken to lower the ad valorem import tariffs and make the tariff schedule as uniform as possible to avoid resource misallocation. Any remaining nontariff barriers should be dismantled. With the adoption of a realistic exchange rate, import liberalization (to eliminate anti-export bias), and the removal of export taxes should be possible. The implications of state ownership permeated the basic practices and procedures of tax administration in these countries. For example, the relationship between the tax assessor and the state-owned enterprise’s tax accountant was less adversarial than in market-oriented economies, primarily because the two are both employed by the state. Another feature of state ownership was that the number of taxpayers was relatively small compared with market economies. Most tax revenue is obtained from the few large state-owned enterprises or collectively owned enterprises through turnover taxes and a profits tax. Also, state-owned banks played a major role in monitoring the tax payments of these state-owned enterprises. As the private sector gained in importance in these countries, the number of tax payers increased and private banks were created that were not necessarily willing to play the same role as state-owned banks. The reform of the tax administration has to start with changes in systems and procedures. The systems and procedures in the former Soviet Union countries were not appropriate for the administration requirements of a market economy. There existed a tradition of manual systems and outdated tax administration procedures: tax payers frequently registered at the local office where they were assigned a local number, as opposed to a national taxpayer identification number that could be used for computerized files. Tax offices in these countries provided limited assistance when there existed questions on how to fill out tax forms. The notion that tax administrators should attempt to reduce taxpayer compliance costs by providing information and assistance, simplifying procedures, or requiring only a minimum amount of information on returns was not clearly understood. Taxpayers typically required that the taxpayer physically make a trip to either a tax office or a bank, as the mail was not reliable. If the payments were made at the bank, the information was sent to tax offices that verified manually the payments. Audit coverage was extremely broad, especially for state-owned enterprises where coverage was often 100 percent. Because the number of taxpayers was relatively small, it was possible for tax officials to visit almost every one of these firms on annual basis to check tax compliance. This is a practice that cannot be continued as the number of enterprises increases, particularly as many small and medium-sized firms and service-oriented activities appear, which by their very nature are harder to tax. In these circumstances, the taxpayers did not bother to keep up with changes in the legislation and negotiated with the tax officials the amount that should be paid. Frequently, the audits were conducted based on the targets in the annual plans of enterprises, in effect auditing the plan rather than the tax liability of the state enterprises. Tax penalties rarely went beyond a general interest payment to specific automatic fines for specific tax offenses that in real terms were very small. Taxpayers had very little room for appealing. The modernization of tax administration in socialist countries requires a major reform. An important step is the elevation of the status of the tax administration to a semi-autonomous organization within the Ministry of Finance to raise the image of tax administration and be able to pay competitive salaries. The long term objective ought to be to organize tax administration on a functional basis cutting across all taxes to allow staff to gain special skills with respect to the function they perform. It facilitates the development of a system of checks and balances where one tax official does not handle all the functions of a given taxpayer. As the tax system modernizes, more reliance will have to be put on tax payers self-assessment that would need to be complemented by a strict enforcement of penalties and a fair appeals process. A sound penalty structure should include financial and nonfinancial penalties for both civil and criminal offenses. The amount of the penalty should be automatic and sufficiently high to deter evasion. Care should be taken to ensure that penalties bear a relationship to the actual tax liability to ensure that it is within the capacity of the enterprises to pay. However, a well designed structure may fail to deter evasion unless taxpayers see that penalties are being rigorously and fairly applied. Finally, taxpayer rights must not be dismissed. The appeals process should allow the taxpayer a chance to voice his or her case before the tax administration, and, if not fully satisfied with the results, before some institution outside the tax administration. Ebrill and Havrylyshyn report that tax policy reforms have begun in almost all the republics of the former Soviet Union, with some countries having made considerably progress.15 Several countries have substantially drafted their tax laws so that they are more congruent with the demands of a market economy. Most progress has been achieved in the elimination of export taxes and excess wage taxes. Mixed progress has occurred in the introduction of the appropriate VAT. Least progress has been made in the removal of inappropriate exemptions. Regarding excise taxes, specific rates have been adopted for alcohol and tobacco but least progress has been made in restricting the coverage to a few important appropriate commodities and giving a symmetric treatment to domestic production and imports. For the personal income tax, most progress has been made in adopting appropriate rate structures but least progress in effectively taxing small businesses. There has been an almost universal abolition of export taxes. These authors note that, not surprisingly, the least amount of progress has taken place on aspects that are either technically very difficult to implement or politically sensitive, such as the introduction of new accounting systems and standards, and the elimination of exemptions. Their overall assessment of the tax policy experience is that it is clear that these countries need to continue to take important steps to address the shortcomings mentioned above to attain a comprehensive tax reform. Progress in tax administration reform has been more slow and more uneven. The pervasiveness of noncash transactions in the economy and the uncertain legislative framework for tax administration has made difficult progress in this area. Lack of strong political commitment to major institutional and procedural reforms and the absence of a strong management team and trained tax administrators to design and implement tax administration reforms have been major hurdles. Ebrill and Havrylysshyn conclude that with only few exceptions, progress in most aspects of organization, collection, and enforcement has been sporadic at best. They recommend that urgent actions are needed to focus arrears collection on the taxpayers with the largest arrears and with arrears that have arisen in the most recent period; establish fully functioning large taxpayer units; develop procedures to impose reasonable penalties; and establish a single, nationwide taxpayer registration system with unique taxpayer identification numbers. Countries like Belarus, Turkmenistan and Uzbekistan that significantly delayed reforms and retained more of the Soviet-period mechanisms of control over enterprises were generally able to maintain high levels of revenue collection. Countries that proceeded with reforms and that were not affected by civil strife, such as Kazakhstan, the Kyrgyz Republic and Russia, all experienced a clear trend reduction in their revenue ratios. In the Baltic countries, where reforms came early and advanced rapidly, there was neither a perceptible revenue decline nor indications of revenue levels that were too low for reasonable government operations. Not surprisingly, the most noteworthy feature as regards the pattern of changes in the major revenue components is the uniform decline in enterprise profits taxation, largely independent of overall revenue developments. This has been a reflection of, among other things, a combination of falling profitability, growing difficulty in administering profit taxes in economic transition, and the removal of excess wage taxes. These developments suggest that while avoiding economic reform might have helped maintain revenue close to levels of the Soviet period for some period of time, substantial and sustained progress in reform gave better results. This is a similar conclusion with that for growth recovery in economies in transition. Delaying reforms can minimize the output decline of transition, but the best result comes form strong reforms that lead to early recovery and sustained growth. National budgets in the former Soviet Union included the budgets of the central governments and subnational governments (provinces, municipalities, and prefectures).17 The provincial and local budgets were prepared in conformity with the guidelines provided by the central ministry of finance, and the budgets so prepared were reviewed and consolidated by the central governments. The budgets also reflected extensive linkages between government and public enterprises. Traditionally, the state provided from its budget all the capital needed for the establishment of enterprises and the needed inputs, and bought the outputs. In return for the capital provided, the state demanded and received in turn, in addition to turnover taxes, a share of the profits as well as a share of depreciation reserves. The close links between the government budget and the enterprises resulted in a situation where transactions were conducted without any movement in cash. Taxes due were routinely adjusted against subsidies to be paid or capital to be transferred. In addition, the budget itself showed total revenues net of subsidies paid to enterprises. These practices were not conducive to transparent budgetary practices or to effective spending controls. In addition, there was a proliferation of extrabudgetary funds created to provide a measure of managerial autonomy to budget units with own resources to ensure “a more efficient use of resources.” These extrabudgetary funds grew in number and spawned a number of activities, and in some countries grew in size to a dimension equivalent to the size of the state budget such as in China. They tended to blur the distinction between what is basically a budgetary task of the government and the task of an enterprise. Some aspects of the budgetary process of former centralized economies are worth highlighting.18 First, general guidance was provided in the preparation of the budget as to the areas where investment was needed and the kind of production targets that were expected to be fulfilled. On this basis, the concerned agencies prepared a number of project proposals for review by the planning agency. The prices assumed for this exercise reflected the valuation of the officials. Second, while budgetary programs were reviewed, approved, and monitored by a central body, before final decisions were made, there was a substantial input from all concerned into what was included in the plan and the budget. During this stage there was room for bargaining at every level. Depending on the politics, the plan set the framework for the budgets or negotiated budgets set the basis for plans. Moreover, once the plans and budgets were approved, there was really a measure of flexibility given to executing agencies, subject, of course, to the compliance of various process controls. This operational freedom provided a relief from the high degree of centralization that was implicit in the process. Finally, another aspect worth noting in the budgetary process was the role of the legislature and the role of the officials who prepared the budget. In most countries, the party congress played a key role but the way it exerted influence was different from the way legislatures in market economies exert powers. The party congress did not have taxing powers or specified roles in introducing and processing expenditure bills. But none of that could take place without the tacit approval of the party congress. Budget officials in this situation had an easy task inasmuch as everything is specified and macroeconomic stability was specified. Prices were fixed by the government and did not necessarily reflect market scarcities. It is this aspect which undergoes a total transformation as economies are opened and prices are fixed by the market. In this new environment, officials preparing the budget have to recognize the impact of the macroeconomic aspects of the budget and the impact of the budget on the economy. This requires making revenue forecasts and preparing contingency mechanisms to cope with changes in the economy. The budgetary procedures of the centralized economies had the advantage of the relative abridgement of the payment process. The assignment of banks to each spending agency reduced the red tape and the numerous steps of verification associated with other budgetary systems. There were too many weak areas, however. The establishment of numerous extrabudgetary funds has tended to overshadow the importance of the budget. It was difficult to assess the impact of fiscal policy with contradictions arising in the approaches of the budget, on one hand, and extrabudgetary funds on the other. The strong role of bargaining in the budgetary process resulted in budgetary outcomes being different from estimates. The biggest problem was the way in which the resource constraints were internalized in the various stages of the budgetary process. Calculations of requirements were made in terms of materials and agencies did not have to think of monetary costs (they were to be financed regardless of cost). In these circumstances, there was a practice to demonstrate a need for more resources, rather than to manage effectively the already available resources. A move to a market economy usually is accompanied by movement toward a system of political freedom and the establishment of democratic forms of government. Under a democracy the budgets have to be more transparent and accountable. The budget should be more transparent to ensure that funds are applied for the approved purposes. Transparency provides the legislative branch an opportunity to monitor the performance of the executive but should not be interpreted as an invitation for micro management by the legislature. Accountability imposes additional tasks on the executive in that it has to ensure delivery of goods and services in an economic, efficient, and effective manner. There was little incentive for government departments in centrally planned economies to economize and there was little concern for the delivery of services. To be able to do this, it is imperative to formulate the budget in the context of a macroeconomic framework with an explicit recognition and assessment of the linkages of the budget and the economy. A realistic projection of government revenues has to be made and of the cost involved in delivering government services. Spending agencies need to be informed of the resource ceilings. Working with a macroeconomic framework would imply that resource allocation would no longer be a matter of ensuring increments, but downward adjustments too. The budgetary process needs to adapt itself to that significant change. The budgetary institutions also would need to be changed in two other associated aspects. The extra budgetary accounts have to be rationalized and incorporated into the budgets. The national budgets in centrally planned economies also included the budgets of the subnational governments, contributing to a good deal of overlap and frequent duplication in the efforts of central and subnational governments. There is a need to clearly define the respective roles, responsibilities, and jurisdictions of the various level of government in regard to revenues and expenditures (this, of course, is not only true for economies in transition). Ministries of finance and budget would need to monitor the implementation of budgets and ensure that macroeconomic policies are on track. For these purposes, the power of finance and budget ministries have to be increased. To institutionalize these changes and minimize the role of bargaining, it would be necessary to approve a new budgetary law. Accounting systems would need to be strengthened so as to ensure the preparation of comprehensive accounts and provide adequate cost information. The changes advocated above will not be easy to implement and by necessity all the changes will not be able to be introduced at once. The strategy for introducing the changes will have to take into account financial and human resource shortages; the heterogeneous requirements of various users of budgetary systems; and the cost to proposed changes and their technological underpinnings. Organizational bottlenecks such as inertia, legal obstacles, efforts at self preservation, and protection of territorial turf will also need to be taken into account. At least temporarily, the budget is likely to be burdened by former implicit subsidies that would become explicit as the reform proceeds. A successful program will require an adjustment in relative prices through domestic price liberalization, the move toward positive real interest rates, and an appropriate exchange rate policy. The mostly upward adjustment of real interest rates and exchange rates will affect those with net financial liabilities, including those with housing credits and foreign debt, that are likely to pressure with some success for budgetary subsidies. Reforms to transform centrally planned economies into market economies compels the countries carrying out these reforms to reduce, or even eliminate, many government activities and to shift these functions (partly or fully) to the emerging private sector. Reforms should be aimed at reducing public ownership and the scope of the budgetary intermediation, and at virtually eliminating traditional subsidies to household and enterprises. In doing this, reformers will face the problem that an analysis of public expenditure in economies in transition is severely hampered by distorted product and factor prices, including controlled product prices, nontransparent publicsector compensation systems, and unrealistic interest and exchange rates. These problems are compounded in the case of Cuba due to the existence of a dual monetary system where transactions are carried out in domestic currency and U.S. dollars. At the same time it is important to remember that in a market economy, the public sector has an essential role to play. The general budget becomes a major instrument of macroeconomic policy. The government has to provide public goods and services that the private sector either does not provide or provides less than socially optimal quantities. In addition, the government through public spending policies redistributes income between individuals, groups, and generations. Difficult policy questions will arise regarding to what extent, if any, there should be transitory budget support for private initiatives. The demand for low taxes will conflict with the demand for resources by the public sector to supply necessary public goods, frequently after years of neglect in their provision, such as in the case of Cuba. Public expenditure policy has an important role to play during the transition period in reducing macroeconomic imbalances, increasing the efficiency of resource use, promoting sustained economic growth, and fostering social objectives. The absence of domestic financial markets has frequently precluded the possibility of domestic nonmonetary financing, while the possibilities of external financing are quite limited because of the existence of external payment arrears. To compound these problems the revenue performance is likely to weaken at the beginning of the process of transition as discussed above. All these factors point to the need to execute substantial budgetary spending cuts as a central element in securing the stabilization of the economy during the transition. A strong case can be made for the elimination of many expenditure programs found in these countries on efficiency grounds. Prime candidates in this respect would be the large budgetary subsidies to consumers and enterprises. These cuts are bound to enhance allocative efficiency. It is frequently possible to reduce unduly large military expenditures. The role of the public sector as a guarantor of employment has been a major source of inefficiency and as the reform process advances it will have to be abandoned. At the same time the wage structure will have to change in the public sector with a more pronounced differences in the pay lines to account better for different skills. Investment expenditures of enterprises will have to rely more on their own retained earnings and even on market financing. The privatization of these enterprises should reduce even further their dependence on the state budget. However, the difficult choices that will arise to the authorities between providing budgetary support to restructure state enterprises prior to privatization or to hand them over to domestic and foreign investors at a very low value should not be underestimated. To establish the basis for sustainable growth, public expenditure policy should emphasize public investment programs in human capital. Investment programs in physical infrastructure should be made in such a way as to maximize their complementary with private investment, while taking into account the possibility that private sector responses may not be fast enough. In framing public expenditure policy, the policy makers will need to take into account the need for the public sector to contribute to national savings given the usual limited foreign financing possibilities. There may be a role for public expenditures (or tax expenditure) to support private initiatives to compensate for market imperfections and uncertain business climate. There are likely to be demands for public resources to clean the balance sheet of banks and enterprises arising from the mismanagement and distortions created under central planning that would need to be addressed eventually. The public sector will need to also be instrumental in protecting the poor and the environment. The traditional social programs (particularly pension, sickness, and family benefits) should be made more efficient and targeted to the poorest and more vulnerable. There will be a need to establish a social safety net program, not an easy thing to do with the budgetary constraints that are likely to exist. Another key area, frequently neglected in the central planned economies was the environment. Care will need to be taken to establish appropriate energy prices that will help to eliminate waste but there are likely to be some demands on the budget to clean the environment. In this paper, the fiscal reform of Cuba in analyzed mainly from the perspective of the second objective. An important step to formalize the ongoing efforts appears have been taken in April 1999 when Decree- Law 192 (DL 192) on the Financial Administration of the State was approved. DL 192 replaced the Organic Law No. 29 of July 1980 that had established the budgetary framework and had become obsolete, especially after the appearance of new forms of property in the economy. DL 192 is supposed to pursue the objectives of generating financial resources for the public sector in order to allow the implementation of government policies and programs, including those carry out through public entities and enterprises. The law is supposed to provide the basis for the development of information systems in a timely and reliable manner. To attain these objectives, the law defines the legal provisions for the budget, public credit, treasury operations, and government accounting. It also specifies that the existing tax legislation remains in effect. The Tax System Law (Law 73), passed in August 1994, modified both direct and indirect taxation. The provisions of this law are still in effect. As a result of this law, the profits of all enterprises (personas jurídicas) has been gradually made subject to the corporate income tax at a single rate of 35 percent. Prior to this law only mixed enterprises and private enterprises (sociedades anónimas) were subject to the income tax. There is a simplified system for smaller enterprises. The private enterprises, mixed enterprises and certain state entities were fully brought under the new corporate income tax regime between 1994 and 1995.22 The incorporation of state enterprises (paraestatales) began in 1996. According to CEPAL, corporate income tax receipts grew rapidly after 1994 and amounted to 1,132 million pesos, equivalent to 30 percent of direct taxes and 12 percent of tax revenue in 1998 (See Table A.13 of CEPAL (2000)).23 About two-thirds of the corporate income tax in 1998 was accounted for by the 1,700 state enterprises incorporated into this tax regime. In the case of the state enterprises, their adoption of the income tax regime has been compensated by some tax exemptions, not only from the corporate income tax, but also from the tax obligations on the utilization of the labor force, and from import duties. No official estimate exist of the tax expenditure involved in these exemptions. In addition, there are a number of state enterprises that remain outside the corporate income tax regime because of their unprofitability. These are principally agricultural, textile, and shipbuilding companies. According to the CEPAL report, the objective of the authorities is to have all the enterprises subject to the corporate income tax in the year 2000. Law 73 also established a social security contribution. Enterprises pay 12 percent of the wage bill in social security contributions and retain 2 percent from the wages of workers to cover the cost of the social services they provide to their workers. Moreover, salaried workers contribute with the equivalent of 5 percent of their wages to the social security system. However, there are also exemptions to the general rule regarding these contributions. Among the state enterprises, only workers of enterprises that are participating in a special program (sistema de perfeccionamiento empresarial) pay these contributions and only after their salaries have been revised in line with new salary scales. In addition, Law 73 established that profitable enterprises pay a 25 percent tax on the utilization of the labor force, while the social security contribution is reduced to 14 percent. In the case of joint ventures with foreign investors a tax of 25 percent is only applied (14 percent of the contribution of the social security and an 11 percent rate of the tax on the utilization of the labor force). There are excise taxes on tobacco and beverages that are becoming an important source of revenue since their creation in 1994 (2,292 million pesos in 1998 or 25 percent of tax revenue). The service tax precedes the Law 73 and it is imposed on essentially two type of services: those provided by state restaurants and electricity supply (totaling about 5 percent of tax income). Other taxes and duties are mostly import duties, followed by tolls (peajes) imposed mostly on airport use by tourists, and document taxes. Import duties apply to all imports, including those of the state. CEPAL (2000) reports that the maximum import duty was 40 percent in 1999 and that the arithmetic mean of the import duties was 10.7 percent for most-favored- nation country imports and 12 percent in general. Import duties have declined as the import duty rates have been lowered in line with Cuba’s commitments in the World Trade Organization and the stagnation in imports (370 million pesos in 1998). The share of nontax revenues in total revenues has been declining in recent years (see Tables 1 and 2). In 1999 they are estimated to have accounted for 2,489 million pesos or 20 percent of total revenue, almost half of what they were in 1989. These revenues consist of dividend payments of state enterprises that pay income tax and the transfer of profits of state enterprises that are still not incorporated in the new tax system. Fines and other charges are also included. There are also charges for the use of state land paid by mixed enterprises, and royalties for the exploitation of mineral resources. Overall, Cuba’s revenue performance deteriorated during the 1990s, reflecting the experience of former Soviet Union countries during that period, except that in the case of Cuba the observed decline in revenues is probably more the result of the strong negative shock to economic activity produced by the loss of the Soviet subsidies, and less to efforts to move to a market economy. 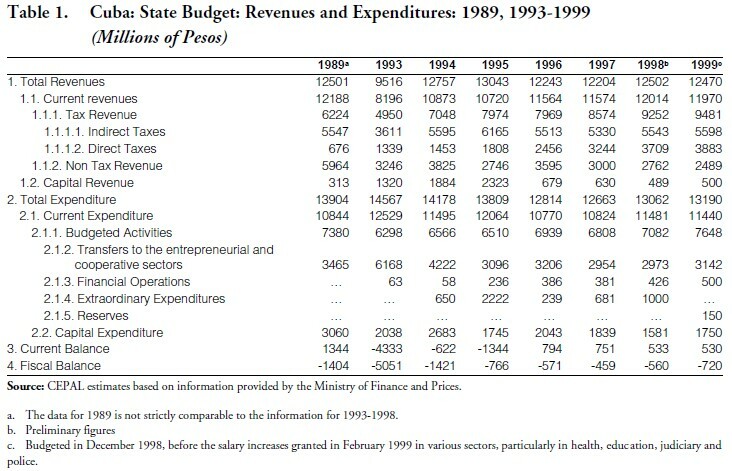 Between 1989 and 1993, total state revenues declined on average by 10 percent in real terms, in line with an average real GDP decline of 9 percent per year.28 The decline was particularly pronounced in revenues of turnover taxes, profit contributions of state enterprises to the budget, and nontax revenues that are very sensitive to economic activity. In 1994, the tax revenues improved by over 40 percent in nominal terms (see Table 1) due to the introduction of excise taxes on tobacco, beer, liquor, and automobiles and the increase of public and import tariffs. Improvements in tax administration were made in the second half of the 1990s, after the creation of the Oficina Nacional de Administración Tributaria (ONAT). A first step has been to accelerate the registration of personal taxpayers and enterprises. The number of enterprises registered with the ONAT increased from 16,144 in 1996 to 20,805 in June 1999, the majority being state enterprises, budgetary agencies, and Unidades Básicas de Producción Cooperativa (UBPCs).30 In addition, there were registered 1,152 agricultural cooperatives, 965 sociedades mercantiles cubanas, 706 commercial representations, 135 mixed enterprises and 47 sociedades mercantiles extranjeras. About 193,000 persons already have a tax identification number, out of a total of 362,385 taxpayers, of which 156,000 are self-employed (cuenta propistas),and 8,000 are persons who earn income by renting dwellings. CEPAL (2000) reports that the tax forms have been revised and the control systems improved. Since 1998, taxes are collected in the currency that the revenues are generated.31 From 1997 general tax audits are being emphasized that aim to verify the payment of all taxes in the visits to taxpayers. The authorities are apparently increasing the technical assistance in the area of fiscal accounting and tax code obligations to civil servants, but the ONAT has not been able to expand these services to the private sector. A unit to deal with large tax payers has also been formed in the ONAT. The Cuban state budget consists of the consolidation of the central government budget, and the budgets of the agencies of the central government, provinces and municipalities.32 First, the Council of Ministers establishes the priorities with the Economic Plan as background. Once the priorities are defined, the Ministry of Finance and Prices (MFP) issues norms for the preparation of the budget. About some 200 budgets are prepared that are subsequently consolidated into the state budget. Decree Law 192 allows the MFP to modify the budgetary appropriation during the year as long as the total spending amount of the state budget is not affected.33 Transfers from the central government to provinces are a function of the coefficient of participation of the provinces in the turnover tax, the profit tax, and the current transfers of public enterprises of the central government. The coefficients of participation are determined every year at the time of the preparation of the state budget and they are established taking into account the differences in economic and social development among the provinces. The provinces do not have taxing authority and their deficits are covered by budgetary transfers. Reflecting the high degree of centralization in the Cuban economy, the central government accounted for 73 percent of total state spending in 1996.34 According to CEPAL (2000), the high central government share in state spending is in large part due to the fact that the government accounts for 98 percent of the spending in state entrepreneurial activities (probably included in line 1.1.2, transfers to the entrepreneurial sector, in Table 3) and over 80 percent of investment spending. Meanwhile, subnational governments accounted in 1996 for 41 percent of current budgeted expenditure such as in primary and secondary education, municipal hospitals, and other health spending The central government accounted for 36 percent of current spending, and the social security administration for the remaining 23 percent. CEPAL (2000) urges caution in analyzing these budgetary statistics because of the difficulties of distinguishing between the public and private sectors and deficiencies in public sector accounting. It is also not possible to distinguish clearly between central administration, the state enterprises and the financial sector which makes difficult to make estimates, for example, of general government spending. Until 1999, many enterprises carried out quasi-fiscal activities such as the provision of subsidies and services. The budget recognizes only a share of the cost of these free services through the provision of transfers, and, thus the cost of the provision of social benefits is underestimated in the budget For example, the sugar mills still provide free services to the workers whose financing is incorporated into the cost of production of sugar mills. Another problem is that according to CEPAL (2000), the investment carried out by the enterprises is not accounted for in the state budget as part of investment. The state budget only takes into account the deficit of state enterprises which, in turn, are covered by government subsidies. Public enterprise investment has been growing and accounted for 30 percent of total investment contemplated in the economic plan. The unclear lines of demarcation between the central administration and public enterprises is also manifested in that agencies of the central administration can finance part of their spending through entrepreneurial activities, although the authorization of this entrepreneurial spending is supposed to go through normal channels of approval. The most notorious case is that of the enterprises of the armed forces that have been given the opportunity to conduct business activities in key sectors such as tourism. This is also true in the sport and health sectors. This is an area of concern in Cuba and the authorities are apparently trying to increase the coverage of these activities in the budget. to better monitor them. Another problem in the accounting practices is that in the case of some budgetary units and public enterprises, revenue, spending and financing are not reported separately in a clear way. In the past, in some instances, only the deficits that could not be financed from internal and external sources were reported in the budget. Up to now, the state deficit has been financed by central bank financing, apparently at no cost to the state. This creates another important distortion in the public sector accounts. No provision is included in the budget for interest payments, which is a serious omission of the resources used by the public sector. Not only are interest liabilities not recorded on account of the central bank credits, but neither are the loans in arrears to Paris Club creditors or to Russia (Russia acquired the Cuban debt at the time of the break up of the Soviet Union).35 The existence of an overvalued currency and the administration of a foreign exchange budget by the central government produces implicit transfers between sectors in surplus in terms of foreign exchange and sectors in deficit, that are not well accounted for in the budget. The official exchange rate of US$1 equals 1 peso introduces a strong distortion in the accounting of the value of tradable goods and services in the budget. DL 192 introduced significant modifications in public sector accounting. Transactions are to be registered on an accrual basis. In the state budget all revenues and expenditures are to be registered separately without any netting among them. The exception is the public enterprises that can report net revenues or net losses to the state budget. CEPAL (2000) reports that these new accounting practices are being adopted gradually and that the authorities expect to implement them for the 2000 budget. CEPAL (2000) also points to the need of reducing the earmarking of revenues. 36 These practices, as in other countries that use these arrangements, can distort resource allocation by increasing unnecessarily spending in certain areas without due regard to other budgetary priorities. Current examples of these are the highway tolls which are supposed to be used for road maintenance. Fifty percent of the airport tolls are to be used for the maintenance of the airports and the rest of the proceeds go to the central budget. To control these practices, DL 192 determines that revenues cannot be directed to specific spending without authorization of the Ministry of Finance and Prices, unless the resources come from specific financing operations or grants received for specific purposes. CEPAL (2000) notes that the size of state spending in Cuba in terms of GDP has declined in recent years as a result of the increase in the size of the private sector (called the “segunda economía” in the report) and fiscal tightening. After reaching two thirds of GDP in 1989, and increasing to 88 percent in 1993, it declined steadily to about 50 percent in 1998. Table 3 shows that current spending accounted for about 87 percent of total spending during 1997-1997 in Cuba, while capital spending amounted to about 13 percent of total spending during these years, compared with 22 percent of the total in 1989. Among current spending, budgeted expenditures, that encompass salaries and a wide range of public administration services (such as education, health, housing, social security,37 defense, internal security, culture and sports), and transfers to enterprises and cooperatives are the two largest current spending categories, accounting for about 90 percent of total spending during 1997-1999. The relative size of salaries in total spending has risen to about 17.3 percent in 1999 from a level of 14.6 percent in 1993. Education, health, housing, and social security spending included in public administration spending are recorded in gross terms, but other activities such as defense, internal security and sports where the implementing agencies have their own sources of revenue are still recorded in net terms reflecting the accounting problems referred to above. Total state spending declined from 70 percent of GDP in 1994 to 50 percent of GDP in 1998. Apparently, the Cuban government has tried to protect social spending during the period of fiscal tightening and, as a result their relative share in total spending rose, while those of defense and internal security lost ground. While spending in education, health, and social security only declined from 19.3 percent of GDP in 1994 to 17.6 percent of GDP in 1998, the contraction in real terms has, of course, been sharper. Transfers to enterprises include those that are given to subsidize the impact of policy decisions (e.g. price subsidies) and those granted to cover operating losses of state enterprises. These transfers have declined from the equivalent of 42 percent of total spending in 1993 to about 24 percent in 1999. According to CEPAL (2000) most of the decline has taken place in the transfers granted to cover operating losses of enterprises, while transfers to finance losses created by price subsidies have experienced relative growth. The operating losses of state enterprises increased dramatically from the period prior to the break-up of the Soviet Union up to 1993, when they reached a level equivalent to 33 percent of GDP.38 After 1993, state enterprises were asked to prepare restructuring plans that apparently were successful in reducing the subsidies to only one fifth of what they were in 1993 by 1998. CEPAL (2000) warns rightly against making too much of a distinction between subsidies that are given to cover open price subsidies and those that are given to cover operating losses of enterprises. Relative prices are seriously distorted in Cuba and state and mixed enterprises cannot carry out foreign exchange transactions outside the official exchange market where the peso is sharply overvalued. In these circumstances, it is difficult to distinguish the reasons behind the losses of enterprises. The third largest component of state spending, capital expenditure, also shows a relative decline during the 1990s, dropping from about 22 percent of total spending in 1989 to 12 percent of total spending in 1998. For 1999, there is a relative increase in the budgeted amount in capital spending of 10 percent in nominal terms that it is expected to be complemented also by an increase in investment in state enterprises whose investment is not included in Table 3. As noted above, accrued interest liabilities are not shown in the budget. The Cuban government has taken important necessary steps to reform the fiscal policy regime to adjust the economy to the external shock that it suffered when the large Soviet subsidy to Cuba was eliminated and to begin integrating the Cuban economy into the global economy. However, in most areas the steps taken appear to be timid and not adopted within a well thought out strategy. This experience mirrors that of several republics of the former Soviet Union, as noted above, but it is also a reflection of the fact that the Cuban government, contrary to the more successful republics of the former Soviet Union, has not made the decision to transform its socialist economy to a market based economy. The results of the tax reform have been mixed if judged from the perspective of establishing a tax system that meets the revenue requirements; beginning to change the tax system toward a more appropriate structure for the longer run; and making the existing taxes more stable and transparent as well as incentiveenhancing and equity improving. The tax reform of 1994 arrested the revenue deterioration, particularly with the introduction of excise taxes. But most taxes suffer from arbitrarily narrow tax bases and, as noted by CEPAL (2000), from excessive exemptions that limit seriously their buoyancy. In the case of the corporate income tax, state enterprises are only being made subject to the corporate income tax gradually and have been exempted from the payments of other taxes when they have been made subject to the payment of this tax. This is not a very transparent method and can be subject to abuses. 39 To be fair, the incorporation of the state enterprises into the tax system could not be made overnight, but the process seems to be taking too long, suggesting the possibility of arbitrary decisions. CEPAL (2000) argues that the generalized application of the income tax to corporations cannot be implemented until a financial reform is carried out. Presumably, the argument is that by exempting companies from the payment of income taxes, resources are maintained within the enterprises that can be used to make the necessary investments. Only after domestic financing resources are available to these enterprises, should they be made liable for paying income taxes. Undoubtedly, a financial system reform is necessary in Cuba but aside from this, all enterprises in the country need to carry a fair share of the burden of revenue mobilization. State enterprises, in particular, should be made subject to a minimum profit tax as a minimum return on past state equity. Consideration may be given to reducing the top marginal tax rate of 35 percent, a rate that appears to be on the high side, particularly for a country with Cuba’s level of development. Loss making enterprises should not be exempted a priori from the corporate income tax regime, and should be forced to become profitable or shut down. In this way, the spending of scarce resources without going through the discipline of approving them in the state budget (where the relative merits of such expenditure can be evaluated) will be avoided. The marginal tax rates of the personal income tax are set at very high levels. International experience shows that this is counterproductive and encourages tax evasion. In addition, the fact that as a transition measure, salaries in domestic currency and the salaries of workers in priority sectors are exempted, has narrowed considerably the base for this tax. This conclusion may need to be qualified if the government retains a very high share of the dollar income of Cuban workers who work for foreign companies in Cuba and the revenues generated this way are not classified as income tax revenue. If this is the case, then the argument can be made that the income tax rates for the workers employed by foreign companies should be lowered and that these workers should receive the same treatment as other taxpayers on equity grounds. In general, it is clear that the current announced income tax rates are a strong disincentive for the entrepreneurial activity of cuenta propistas, limiting the dynamic role that this small, but key sector of the economy, can play. CEPAL (2000) notes that the government faces the difficult problem that the salary structure in the public sector is very low and that before the tax base of the personal income tax can be widened, the salary structure has to be revised. This undoubtedly is a difficult problem but it has more to do with spending priorities and the tax bases of the various taxes can be widened as part of a sweeping reform program that can include some salary increases. As noted above, the main revenue raisers in Cuba are the turnover and the sales taxes (impuesto de circulación and impuesto de ventas). The announced policy is to convert the sales tax into a VAT that would substitute the impuesto de circulación. As discussed earlier, this is the most recommended consumption tax. At the present time, it does not appear that specific steps are being taken to adopt the VAT but given the stage of institutional development in Cuba, this is probably unavoidable. However, again care should be taken that the bases of existing indirect taxes are as wide as possible, and the tax rates should be converted to ad valorem rates if it has not been done already. In moving to a value added tax, the number of rates should be few and will need to be made uniform throughout the island to avoid creating distortions. Municipalities could be allowed to charge some sales tax, as well as property taxes, something that will require the eventual development of a cadastro. The role of the tax on the utilization of the labor force and of the contribution to the social security would need to be reexamined. The current payroll taxes appear to be on the high side and to discourage the demand for labor. As other buoyant taxes are developed, it may be possible to reduce the rates of these taxes, while still addressing the very difficult problems of the social security system in Cuba.40 The average import duty of Cuba, at around 11 percent, does not appear to be high, although as recommended by Gallagher,41 consideration should be given to making all imports subject to a single rate to avoid distortions. Not much information is available regarding the changes in tax administration to be able to assess how much progress has been made in improving tax administration practices. Necessary steps are being taken such as registering tax payers, but again the progress in this area is rather slow. The number of personal and corporate taxpayers registered so far in Cuba appear to be rather small given the size of the country. It is not known to what extend systems and procedures are being simplified and made more taxpayer friendly to facilitate the creation of a tax paying culture and permit the smooth processing of returns and payments. These are key steps that need to be taken. The creation of a large taxpayers unit is a positive step and will increase the returns on audits but the decision to do general tax audit to cover all taxes in visits to taxpayers can be questioned because the alternative of doing single-items audits would increase coverage of tax payers, while, at the same time, reducing the possibilities for corruption. DL 192 takes important steps to reform and improve budgetary practices in Cuba. For example, as explained earlier, it calls for state budget revenues and expenditures to be registered separately without any netting among them and provides the legal means for reducing earmarking of revenues by determining that revenues cannot be directed to specific spending unless authorized by the Ministry of Finance and Prices. However, the information contained in CEPAL (2000) and discussed earlier shows that actual practices still have a low level of transparency and are not conducive to accountability by spending units. The carrying out of quasi-fiscal activities by state enterprises which go unreported, or the fact that deficits that obtain financing domestically or externally are not clearly reported in budget documents, reduce the transparency of public expenditure, and make it difficult to hold high accountability standards. Also, the fact that parts of the central administration can finance its spending through entrepreneurial activities also goes against the intentions of improving the transparency in budgetary practices. These practices, as well as the high degree of earmarking of revenues, would need to be eliminated in order to move to a more modern approach to budget management. Making the earmarking of revenue subject to the authorization of the MFP would not appear to solve the problem because it would give too much discretion to the MFP. It is not clear to the author to what extent the state budget is prepared within a realistic macroeconomic framework; the extent that the respective spending responsibilities of various levels of government are well delineated; and the extent that the spending units are informed of their resource ceilings and are held to them. Unless this is done in Cuba, the state budget would not be a very useful instrument for public administration. Finally, steps should be taken to start showing in the budget the cost of financing of state deficits by showing the accrued interest arising from the financing of the deficits, even if the deficits are financed by the central bank. Perhaps the area where the least progress has been made in reforming the fiscal regime in Cuba is public spending. Although according to CEPAL (2000), public spending in relation to GDP was down from 70 percent of GDP in 1994 to about 50 percent in 1998, this ratio is still too high for an economy that needs to open room for private sector initiative to attain higher levels of growth. For example, transfers to state enterprises still accounted for 24 percent of total state spending in 1999, a proportion that indicates a highly distorted economy. For Cuba to start a more serious transition towards a market economy, it would need to start reducing public ownership in the economy and the scope of budgetary intermediation, and start cutting traditional socialist subsidies to households and enterprises more effectively. As discussed above, this does not mean that the public sector does not have a key role to play, particularly in the areas of investment in human capital, in social programs to protect the poor and the more vulnerable, and in programs to protect the environment. There are also likely to exist relatively valid demands to use public money to clean the balance sheet of certain enterprises whose performance suffered under the distortions created by the socialist regime before they are privatized. In addition, there may be a role for public expenditures to compensate for limited periods of time for market imperfections and uncertain business climate. However, given the need for the public sector to contribute to national savings and the limited financing possibilities available to Cuba, this type of assistance would have to be rather limited in framing public expenditure policy. 1. The views expressed here are those of the author and do not necessarily represent the official views of the International Monetary Fund. The author would like to thank Mr. Jorge Mattar of CEPAL (Mexico) for making available before publication the chapter on public finances of the 2000 CEPAL report on the Cuban economy written by Juan Carlos Moreno Brid; Messrs. John Norregaard and Jorge Pérez-López for providing other reference material; and Mr. Joaquín Pujol for presenting the paper on his behalf at the 10th Annual Meetings of ASCE. 2. The sections on tax policy and tax administration of the former Soviet Union countries draws on Tax Reform in the Baltics, Russia, and Other Countries of the Former Soviet Union, by an IMF staff team led by Liam Ebrill and Oleh Havrylyshyn, Occasional Paper 182, International Monetary Fund, Washington, D.C. 1999. 4. See Ved P. Ghandi and Dubravko Mihaljek, “Scope for Reform of Socialist Tax Systems,” in Vito Tanzi: Fiscal Policies in Economies in Transition, 1992. 5. At the same time, it should be noted that the administration of this tax was easy within the central planning system. Since the only legal form of payment between the enterprises and retailers was transfers on accounts in the state bank, and since prices were administratively fixed and the volume of their turnover closely monitored, the possibilities for tax evasion or for tax arrears were small. 6. Ghandi and Mihaljek, op.cit., page 148. 7. The discussion in the following paragraphs draws on Ghandi and Mihaljek, op.cit., pp. 155-166. 8. As the reader can appreciate there are complex technical issues regarding enterprise taxation that would need to be decided as a transition economy successfully turn into a market economy that are beyond the scope of this paper. 9. P. Shome points to a number of factors behind this trend: the top personal income tax rate has fallen continuously, the personal exemption level in terms of per capita GDP has been steadily raised, and the authorities have not been successful in removing existing personal allowances, deductions and incentives that erode the tax base. See P. Shome, Taxation in Latin America: Structural Trends and Impact of Administration, IMF Working Paper, WP/99/19, February 1999. 10. Some key implementation issues for adopting a VAT are discussed in the tax administration section. 11. Alan A. Tait, “Introducing Value-Added Taxes,” in Vito Tanzi, op.cit. 12. This section draws on Milka Casanegra de Jantscher, Carlos Silvani, and Charles L. Vehorn, “Modernizing Tax Administration,” in V. Tanzi, op. cit. 13. Several transition economies have only required individuals who carry out business activities to register. Individuals for whom wages are the only source of income have not been required to register and file tax returns. 14. Ebrill and Havrylyshyn, op.cit., p. 12. 16. See Ebrill and Havrylyshyn, op.cit.. Chapter II. 17. This section draws on A. Premchand and L. Garamflavi, “Government Budget and Accounting Systems,” in V. Tanzi, op. cit. 18. For a detailed discussion see Premchand and Garamfalvi, op. cit., pp. 274-280. 19. See Ke-Young Chu and Robert Holzmann, “Public Expenditure: Policy Aspects,” in Tanzi, op.cit. 20. La Economía Cubana: Reformas Estructurales y Desempeño en los Noventa, CEPAL, 1997 and 2000. 21. The description of the tax reform and of the evolution of the expenditure policy in Cuba are based on the material contained in the public finances chapter of CEPAL (2000). 22. Persons or companies who rent dwellings have been subject to this tax since 1997. In 1998 small sugar cane farmers, who before were subject to special regimes, and foreign companies, previously exempted from income tax, were made liable to it. In the case of the latter, the author is not sure whether this was a general decision or whether some foreign companies are still exempted of income taxes according to the original terms of their investment in Cuba. 23. Out of a total of 48.3 percent of GDP in state revenue in 1998 (compared with 62.6 percent of GDP in 1994), tax revenue accounted for 35.8 percent of GDP of which 21.4 percent was indirect tax revenue and 14.3 percent direct tax revenue (See Table A.14 of CEPAL (2000)). 24. Fernão Lara Mesquita, a correspondent for the Brazilian newspaper O Estado de Sao Paulo, reported in the edition of July 17, 2000, that Cuban workers who are paid between $500 and $600 by foreign companies operating in Cuba only receive $30 or less, with the rest being kept by the government. 25. CEPAL (2000), p. 110. 26. CEPAL (2000), pp. 110-111. 27. CEPAL (2000), Table A.13. 28. CEPAL (2000), pages 134-135. 29. CEPAL (2000), page 117. 30. CEPAL (2000), page 133. 31. It is not clear to the author whether the tax rates on dollar revenues are different from those on peso revenues. 32. For the period prior to the 1990s, see Jorge Pérez-López, The Cuban State Budget: Concepts and Measurements, North-South Center, University of Miami, Research Institute for Cuban Studies, 1992. 33. CEPAL (2000), page 107. 35. For a discussion of the Cuban external debt see, Alberto Martínez-Piedra and Lorenzo Pérez, “External Debt Problems and the Principle of Solidarity: The Cuban Case,” in Cuba in Transition—Volume 6, 1996. 37. Social security expenditure data apart from spending on old-age, disability, and survivors pensions included until very recently subsidies to enterprises to avoid the dismissal of redundant workers. 38. CEPAL (2000), p. 123. 39. An area not discussed in this paper is that of the tax holidays given to foreign investors. Anecdotal evidence suggests that they have been excessive in Cuba. 40. For analysis of the problems of the social security system in Cuba, see my paper “The Pension System of Cuba: The Current Situation and Implications of International Pension Reform Experiences for Addressing Cuba’s Problems,” in Cuba in Transition—Volume 8, 1998. 41. Mark Gallagher, “Some Ideas for Taxation during Cuba’s Transition,” in Cuba in Transition—Volume 9, 1999. Gallagher and René Costales, in commenting on Gallagher’s paper, emphasize the importance of having transparent taxes, easy to collect, with few rates and exemptions. These recommendations go in the same direction as my own.